We’ve put together a list of tools to help you promote your conference, even on the smallest budget. You could be planning the best research event in the world, but if you don’t promote your conference – and no one submits or attends – what’s the point? We’ve put together a list of tools that will help you to advertise your event, even with a small budget. Dr James McQuivey of Forrester Research estimates that one minute of video has as much value as 1.8 million words. You could create a simple interview-style video with your chair or keynote speakers to promote your conference. A video like this requires little or no editing, but investing more time will be worth it, especially in considering 1.8 million words would take you 150 days to write. To create a video in-house, you can use apps to give it a more polished look. Magisto is a particularly intuitive app that lets you upload images and videos easily. Animoto lets you work off templates to include your own images, edit clips and add sound. You could go to a local video producer or use an app where you can post your requirements and a select group of creators will let you know how they can help. Email campaigns are sometimes seen as the old fashioned way to market, but they work great for conference promotion. The return on investment in email promotion is 38:1 on average, according to a Litmus survey of 372 marketers worldwide. The time involved is minimal for the potential return. Get an external tool such as MailChimp or Campaign Monitor for this, or check if your conference management system has an inbuilt email marketing tool. Tools like these are easy-to-use and take away the complex tech side of things, allowing you to focus on the content. Each lets you send to an uploaded list of recipients, track the open rates and manage subscribing and unsubscribing. Content is king, and each email should contain fresh information about your event. Emails for early bird closing, new speaker announcements or activities in the event location keep recipients interested. The first thing someone will see in their inbox is your subject line. It is very important that this is catchy and evokes interest. Your subject line can have a bearing on whether the recipient opens the email or not. Generic subject lines can get lost in the crowd, and may even get caught in spam folders. Remember, your audience members are busy academics and researchers, they get tons of emails every day so when you’re promoting your conference you must make your email stand out from the rest. The next stage is the actual email. When someone opens your email, you have around five seconds to get your message across. Getting your point across effectively is a mixture of the quality of the information and the design. The content needs to be easy to read, not be too long and have a clear indication of what the next action is. When looking at the design elements of your email, it must look good and be relevant to your conference. So spend time on good design. While you may choose not to use pictures in your email, it doesn’t mean it can’t be visually effective. Take the two emails below as examples. The first one is a plain email sent from any mailbox. It doesn’t look easy on the eye or entice someone to read it. The generic subject line doesn’t feel personal or significant as it doesn’t relate to any particular conference or include an action to take. There are no headings to break up the different sections. The second is a typical email sent through the Ex Ordo system. It looks a lot clearer, yet no images have been used. While these steps seem very simple, they are often not carried out effectively. By having a good subject line and appealing content (both visually and to read) in the email to back it up, a good foundation will be in place for your CFP. Segment your email list, if possible. This allows you to tailor your emails to the interests of the reader. This is particularly helpful if you’re organising a large or interdisciplinary conference with a number of different topics or tracks. Add a newsletter sign-up form to your website to encourage people to sign up to updates about your conference and build your email database. Don’t forget to personalise. Collect first names on your email signup form, and address emails by name. Social media is a powerful tool. And it’s a fantastic (and free) way of spreading the word and promoting a conference to academics. So, let’s get you started. Twitter is the most popular social media channel for academics, so it’s the perfect channel for conference promotion. Other social media channels such as Research Gate, Academia.edu and LinkedIn are popular with academics, so these might be worth targeting also. When selecting a Twitter handle, go for a more generic name like @DSECconf instead of @DSEC2019. Selecting a name that’s not specific to this year’s conference means that the same Twitter account can be used for all future iterations of the conference and its promotion. Create a conference hashtag to encourage people to engage in your online conversation. Use something simple like the initials from your conference and the year (e.g.#DSEC2019) but avoid anything complicated which delegates will easily forget. 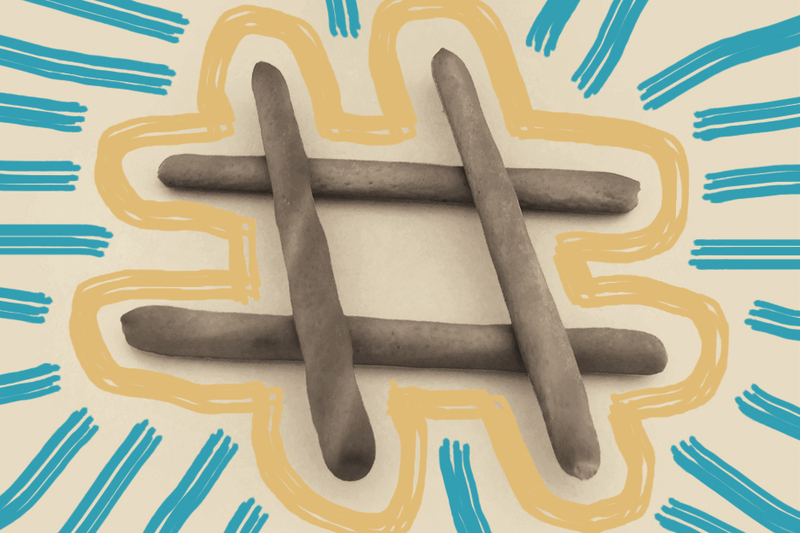 Set up your conference hashtag early to help promote your conference (and monitor how many people are engaging in your online conversation). Then at your conference, include your hashtag on all signage so delegates know what the hashtag is when they’re tweeting. Find other conversations that your target audience might be involved in and join them. This helps to build more awareness of your event with the right people. Some hashtags to get you started are #ResearchMatters #PhDLife and #PhDchat. For hashtags specific to your conference’s research topic area, do a search on Twitter using keywords that relate and find other conversations worth joining to promote on. Content needs to be relevant to your audience. Don’t keep pushing your submission deadline or registration form on people, instead give them interesting content such as information on speakers, panel discussions and topics. And be sure to communicate any news or updates about your conference here too. There’s no limit to how often you post on Twitter, but you must commit to regular updates and monitoring. It’s worth noting that Twitter is more of a conversational tool, so be sure to get back to people and engage with those that tweet your conference. Another benefit of having a Twitter presence is it stretches your event and creates a long-term interaction with delegates. Before Twitter (and social media in general), it was sometimes difficult to interact with delegates outside the actual conference event. Only the important information, such as the call for papers closing date and acceptance emails were shared via email. 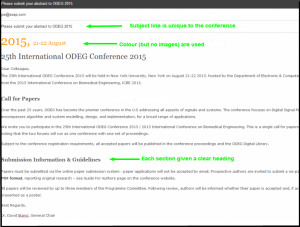 Now, you can share a lot more information about your conference in a less intrusive manner. For example, you can send tweets when a new keynote speaker is announced, have a daily call for papers deadline countdown etc. Also, you can write a tweet in under a minute, and no draft emails need to be composed. Plus, sharing lots of FAQ-style information will also cut down on your chair having to answer the same questions over and over via email. One easy way to promote your conference is to do so via a free directory of research conferences like PaperCrowd. Think of it as putting out a classified ad for your conference. PaperCrowd’s aim is to help researchers find the right conferences. And help organisers get their conferences in front of the right researchers. 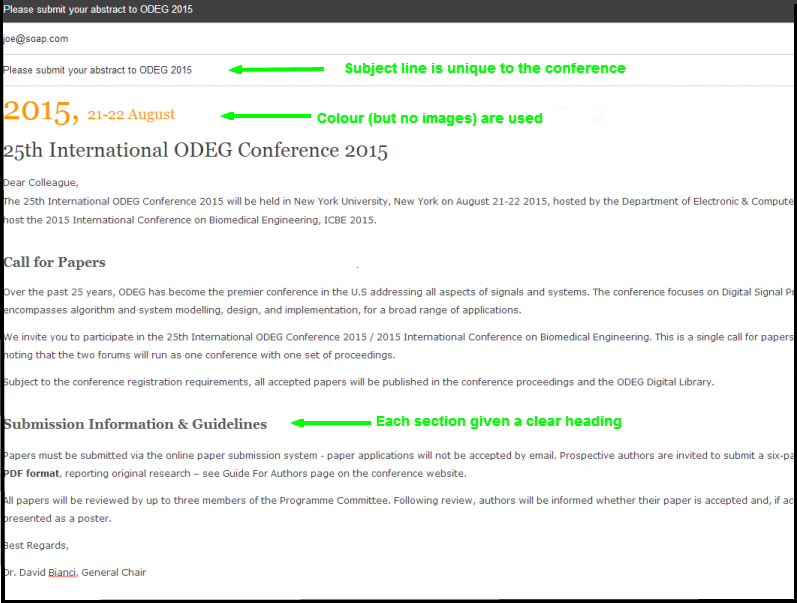 So it makes finding – and following – research and academic conferences a whole lot easier. The website allows you to upload your conference under relevant categories. Once you add your event, researchers who’ve registered an interest in these categories get an alert about your conference and can access your website to submit, register or just find out more. PaperCrowd is all about cleaning up researchers inboxes and helping organisers announce their academic conference in a much simpler way. Adding your event only takes a couple of minutes and automatically makes it visible to the global research community. Networking is in the top 5 reasons to attend any conference, you want to be where the guys you want to talk to are. Publishing your high-profile speaker’s list lets potential delegates see who they can mingle within the hall between sessions. Post the list to your website so the most high-profile attendees can be singled out. Do this by including a picture and short biography of these speakers. PR is a powerful way of promoting any event. If your story is interesting enough, it’s an effective way of getting the word out. It can also be beneficial to your conference’s host institute and local area to gain publicity from your event. And it’s free. All you need is some time to write a press release. You can get lots of information online about how to write a press release, but I’ll share a couple of tips that will help you in the process. Make a list of the media outlets you want to send your press release to. Target specific publications that resonate with your audience. Look at local and national media as well as the niche media relating to your conferences research topics. Once you’ve made your list, you can make your press release specific to each media type you’re targeting. Find out the editor’s or journalist’s name, so that each email is personalised. Chances are, this person gets hundreds of emails every day. Focus on grabbing their attention with an interesting subject line, a strong opening sentence and a concise email. Ask yourself what’s different about your conference. What will the general public take from it? Why will people outside of the conference care about it? These are things that journalists will be considering, so you need to think of them too. Consider the bigger picture. For example, if you’re targeting local media, think of the value – economically or otherwise – your research conference is adding to the local community and tell that story. Try to keep your press release between 300 and 400 words, if it’s any longer you run the risk of losing the reader’s attention. Your opening paragraph (four to five sentences) must contain the five w’s: who, what, where, when, why. The goal is to get your message across straight away. Finally, don’t forget to include a quote. This should give some insight into the conference. Avoid giving information here (you should have already covered this in your opening paragraph) but focus instead on what’s exciting and different about your event. And make your quotes as conversational-sounding as possible.